Resumen: The objective of this paper is to take stock of the available methods and tools for health workforce planning and projections, and to describe the processes and resources needed to undertake such an exercise. Including this introduction, the paper is divided into four sections. In the next section, an overview of workforce projection models and their applications is presented. Then the operationalization of selected models is described in some detail. Lastly, the pathways by which projection results can be optimized to inform decision-making for policies and programmes are discussed. 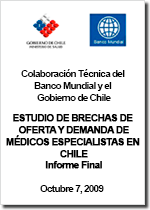 Resumen: Entre septiembre de 2008 y Mayo de 2009, se realizó un estudio sobre la oferta y demanda de Médicos Especialistas en Chile, en el marco de un convenio entre el Banco Mundial y el Gobierno de Chile, que se desprendió del acuerdo suscrito entre el Ministerio de Hacienda y la Comisión especial mixta de presupuesto del Congreso. Esta iniciativa se enmarca dentro de un conjunto de acciones desarrolladas por el Ministerio de Salud tendientes a profundizar el conocimiento sobre las brechas de recursos humanos y a intervenir para cerrarlas. 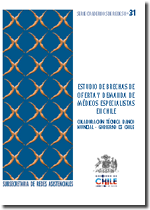 Resumen: El presente informe, tiene como objetivo general de proponer un modelo/metodología de determinación de necesidades de médicos especialistas, que considere los requeridos en cada uno de los diferentes niveles de atención, incluyendo la estrategia de atención primaria de la salud en el subsector público. 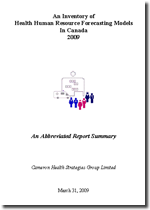 Resumen: With health human resources representing over seventy percent of the health care budget, people remain the greatest asset and the greatest cost of the health care system. The objective of health human resources planning is to equip governments with the information and tools they require to determine how many health professionals are needed to meet the needs of Canadians, both now and in the future. 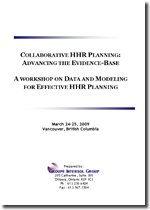 Resumen:On March 24th and 25th, 2009, a Health and Human Resource (HHR) Modeling Workshop was held in Vancouver, British Columbia to review HHR planning projects and successes, identify priority evidence and related gaps and challenges, and propose and prioritize realistic, actionable solutions to these gaps and challenges. This event was co-hosted by the Canadian Institute for Health Information (CIHI) and the HHR Planning Subcommittee of the F/P/T Advisory Committee on Health Delivery and Human Resources (ACHDHR), with the aim of furthering collaborative efforts to find solutions to the HHR challenge facing Canada today.